Alright. I was trying to make something like this top for Phoebe. 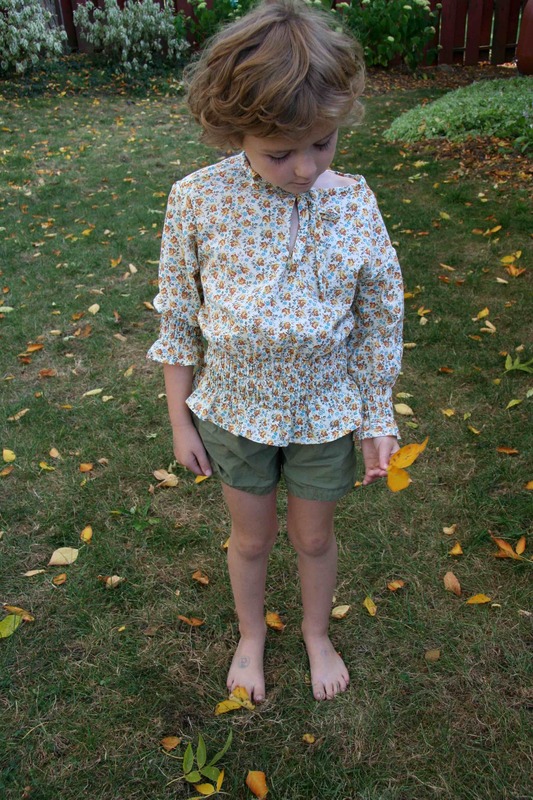 I used this vintage pattern to get the tunic with keyhole neck going and then used the elastic thread trick to smock it up. It’s pretty puffy piratey unfortunately. The size 6 pattern I used was too big. And looking at this picture I think I managed to unevenly hem the bottom while trying to shorten it up last night. I undid some rows of smocking on the bottom and added some up above in an effort to make the top smaller. Maybe I’ll put this in a drawer for next year and see if it’s cuter when it fits her in the shoulders better. I think it’s salvageabe. Okay! What out of my Phoebe pinterest board should I attempt/botch next?! I vote for a knock-off of the mini-boden jumper (w/ red boots). Looks super cute for fall! and yes, I second the vote for the mini-boden jumper. That one is so cute! I know its just that her sleeve is pushed up but your comments made me think of this http://www.sewweekly.com/wp-content/uploads/2011/12/6a00e0098eb615883301538f74d49e970b-800wi.png. LOL, good luck with your next project! It’s not that the shoulders are too huge, what if you zigzagged some elastic around the back neckline to bring it in and let the shoulders sit right?